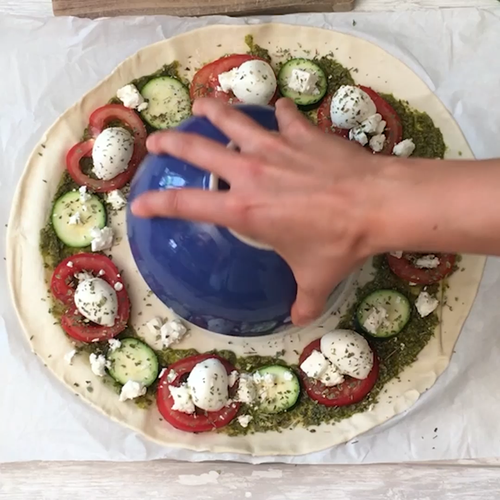 Unroll the puff pastry, place a bowl in the center, and spread the pesto on the pastry in a ring around the bowl. Cut the tomato and zucchini into thick slices and layer alternately on top of the pesto. Add the mini mozzarella balls and feta onto the vegetables and top with a sprinkle of dried oregano. Remove the bowl from the midde and cut a star in the middle of the pastry with a knife. Gently fold the outer edge of the pastry inwards, and the pastry star pieces over the top of the vegetables and cheese. Brush the pastry with egg yolk and add slices of olives on top of the pastry star triangles. Bake for 20 minutes at 375°F and enjoy warm with salad on the side.